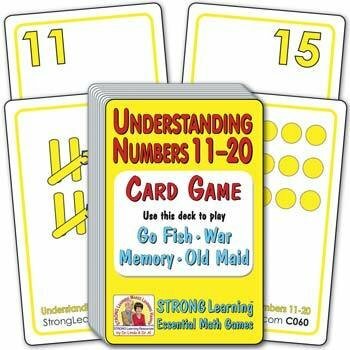 Learn about the Numbers 11–20 while playing popular card games. For this deck, matches are cards that represent the same value. One card shows a number as written; matching cards show the same number using bundles, tally marks, or dots. A Great Value! As with every Strong Learning card game, play any or all of these matching games with the same deck: Go Fish, War, Memory and Old Maid. Everything is included. Ages 4-5+. Contents: 51 standard size cards, 3.5 x 2.25 in. (includes 46 playing cards, directions card, answer cards and Old Maid card).